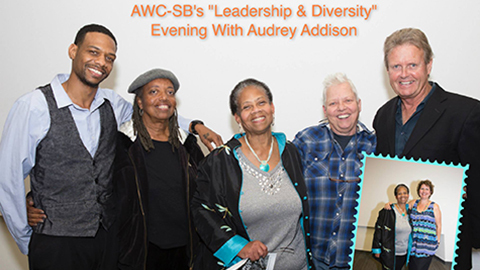 At AWC-SB’s “Leadership and Diversity” event, Audrey Addison Williams, a leader in both the profit and nonprofit world, discussed what diversity and leadership means to her. Her speech shed light on how humans create diversity by our own personal perceptions of the world. Audrey shared personal stories of struggles she faced in her life due to her gender, weight, and the color of her skin. Instances such as when she noticed the valet left her headlights on. She didn’t turn them off for fear someone might think her stealing her own car. She realized where we’re from and how we look effects how we act in society. How others perceptions of us don’t depend on our skin color, but on the way we carry ourselves as well. Audrey explained that while working in Africa, they referred to her as “Mzunga,” meaning white person. Why? Because of facial expressions she made when she spoke. It’s not about race; it’s about how each individual filters the world in their mind. Americans seem caught up in pointing out our differences. How do we fix that problem? Audrey explains that to heal America we must acknowledge the problem. All people suffer. Stop labeling people and remember we’re all human. Our lives are linked together so celebrate diversity and realize it’s our strength. This entry was posted in Featured, Past Events on March 4, 2015 by Lisa.